Alex's time at university took him on a completely different path to where he started. 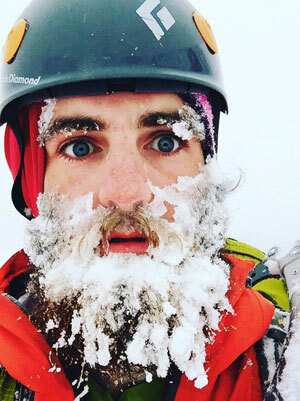 Qualified in computer games design, he now leads outdoor expeditions. Teesside University was the best option to pursue a career in the games industry. I enjoyed my course very much but my career is in a very different industry. I work as a freelancer expedition leader, winter mountain leader and adventure photographer. During my final year at Teesside University I started working outdoors. Alongside my dissertation I trained for my Summer Mountain Leader Award and Single Pitch Award, as well as consolidating my learning for the assessments. I chaired Teesside University Climbing Club and worked as a climbing instructor for the University’s Sport and Wellbeing. I graduated with a first-class honours degree in computer games design and, a few months later, did my outdoor qualifications – Summer Mountain Leader and Single Pitch assessments. These were the building blocks of my career and business. I then started one of the hardest UK outdoor qualifications, the Winter Mountain Leader Award. I completed the training and assessment in 13 months and passed when I was 22 – one of the youngest in the UK at the time. After leaving University I worked as a full-time freelance outdoor instructor. My job involves many things, mostly leading or instructing in or around the mountain environment. This year I began to specialise in overseas expedition work and this has snowballed. I have led groups and performed reconnaissance for an expedition company in many countries including Morocco, Borneo, Mongolia and China. I document these adventures and experiences photographically to share a world of adventure with others. I wouldn't be where I am now without Teesside University Climbing Club and Callum Anderson, Teesside University’s sports development officer (outdoor activities). Working as a climbing instructor improved my professional skills in adventure sports, working with different types of people – children, students and adult with learning difficulties. Working with an adventure sport professional was invaluable for my technical and professional development. Teesside University is fantastic with easy access to outdoor areas and national parks especially extreme sports. I recommend it because of the location, staff, social life, opportunities and the continuous growth of the University facilities and campus, and value for money. My ambition is to become highly qualified in my field, growing my outdoor business and leading expedition work to more difficult locations and objectives.